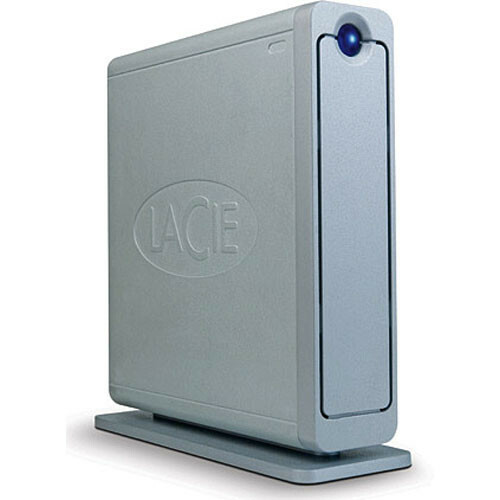 The 320GB d2 Quadra Hard Drive from LaCie is a high-capacity drive with an interface that allows it to be connected via eSATA, FireWire-400, FireWire-800, or USB 2.0. The drive features 8MB of cache memory, a 7200rpm rotation speed, an ultra-quiet design, and sustained transfer speeds of up to 90 MB/sec. The drive is an excellent solution for video editing, high-resolution imaging, data backup, or general storage. 320GB of capacity allows for storage of approximately 24 hours of uncompressed DV digital video, the equivalent of 68 4.7GB DVD video discs, or up to 80,000 MP3 files. The drive easily connects to any computer with an eSATA, FireWire-800, FireWire-400, or USB 2.0 interface. This allows you to easily add it to almost any modern computer. You can choose to use eSATA for maximum performance or USB 2.0 for universal compatibility. The Quadra features a smart fan that automatically adjusts its speed based on the drive's temperature. This ensures that the drive will run as quietly as possible. The drive includes EMC Retrospect Express backup software for both PC and Mac. The software can even be activated via the drive's Shortcut Button for push-button backup capability. The drive is hot-swappable and plug-and-play, so there is no need to turn off your computer while connecting or disconnecting it. The drive's 6.3 x 6.8 x 1.7" footprint makes it ideal for users with limited desk space.